Efofex’s FX Science Tools contains three of the most powerful and useful science tools available for teachers and students. An FX Science Tools subscription lets you use all of the products for one very low yearly rate. You can download FX Science Tools from the links below. These downloads contain fully functional copies of the three products that will run for thirty days. This allows you to fully evaluate the products’ features. If you decide to purchase a subscription we will send you an unlock code that will let you use the products for your subscription period. FX ChemStruct does to organic structures what FX Chem does for chemical equations. Just type the structural formula of a compound and FX ChemStruct will draw a structural diagram. No “drawing” required. FX Equation is a totally different way of entering equations. 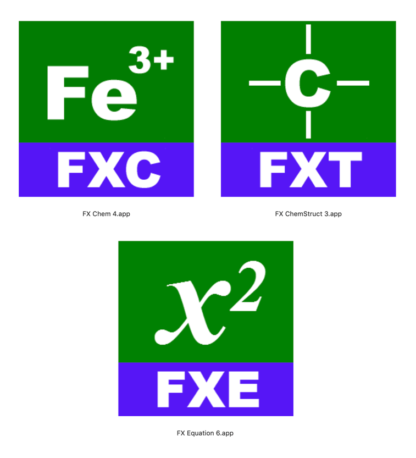 No other program can rival FX Equation’s easy, high speed creation of secondary science equations. FX Equation is for anyone who gets frustrated with their current equation editor. Personal Use Subscription – For personal home use only. Install it on as many computers at home as you need to. This subscription may not be ordered with a school issued purchase order. Small School – For schools with less than 1000 students. All computers on one site of the institution + staff can use the products at home for one year from the activation date. Large School – For schools with more than 1000 students. All computers on one site of the institution + staff can use the products at home for one year from the activation date.